This Sunday is the Second Sunday in Ordinary Time. The readings can be found here. We are in Ordinary Time for the next several weeks, both liturgically and in my daily routine. The kids are back at school and things are getting back to normal at work. As I get back into the routine of daily life, I am noticing the familiar challenges come up: a too busy schedule, too little sleep, pressures at work, etc. Despite these minor annoyances, I realize I am very blessed with good healthy, a good family and a good job. However, I am noticing a dryness in my prayer life. I realize that this is normal but at the same time it is making my anxious. Rather than savor the moment for what it is, I want to get past this period. 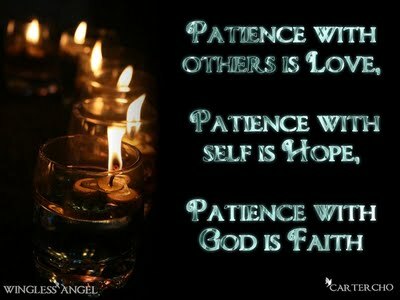 My impatience is showing again and I constantly need to go back to the Patience Trust Prayer that is pasted on my refrigerator. “[R]eal love and life can only be born when a long-suffering patience has created the correct space, the virginal womb, within which the sublime can be born. Perhaps a couple of metaphors can help us understand this. John of the Cross, in trying to explicate how a person comes to be enflamed in altruistic love, uses the image of a log bursting into flame in a fireplace. When a green log is placed in a fire, it doesn’t start to burn immediately. It first needs to be dried out. Thus, for a long time, it lies in the fire and sizzles, its greenness and dampness slowly drying out. Only when it reaches kindling temperature can it ignite and burst into flame. Speaking metaphorically, before a log can burst into flame, it needs to pass through a certain advent, a certain drying out, a period of frustration and yearning. So, too, the dynamics of how real love is born in our lives. We can ignite into love only when we, selfish, green, damp logs, have sizzled sufficiently. And the fire that makes us sizzle is unfulfilled desire. Pierre Teilhard de Chardin offers a second metaphor here when he speaks of something he calls “the raising of our psychic temperature.” In a chemistry laboratory it’s possible to place two elements in the same test tube and not get fusion. The elements remain separate, refusing to unite. It is only after they are heated to a higher temperature that they unite. We’re no different. Often it’s only when our psychic temperature is raised sufficiently that there’s fusion, that is, it’s only when unrequited longing has raised our psychic temperature sufficiently that we can move towards reconciliation and union. Simply put, sometimes we have to be brought to a high fever through frustration and pain before we are willing to let go of our selfishness and let ourselves be drawn into community. This entry was posted in Sunday Reflections and tagged 2nd Sunday in Ordinary Time, 2nd Sunday of Ordinary Time, Catholic, Christian, Fr. Ron Rolheiser, Patient Trust, Patient Trust Prayer, Pierre Teilhard de Chardin, Ron Rolheiser, Second Sunday in Ordinary Time, Second Sunday of Ordinary Time, St. John of the Cross, Sunday Readings, Sunday Reflection, teilhard, teilhard de chardin, Thomas Halik. Bookmark the permalink. This reflection explains what Scripture is all about in a very few words. The birthing metaphor is so beautiful – we need to be prepared for the birth of our Lord in our lives. Thank you for sharing this.